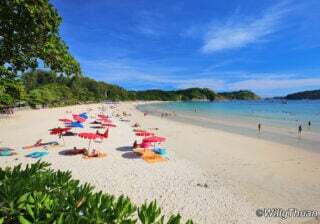 Banzaan Fresh Market in Patong Beach is a great experience during your holiday… it is a lot easier to access than local markets since it is located just behind the huge Jungceylon Shopping Mall. 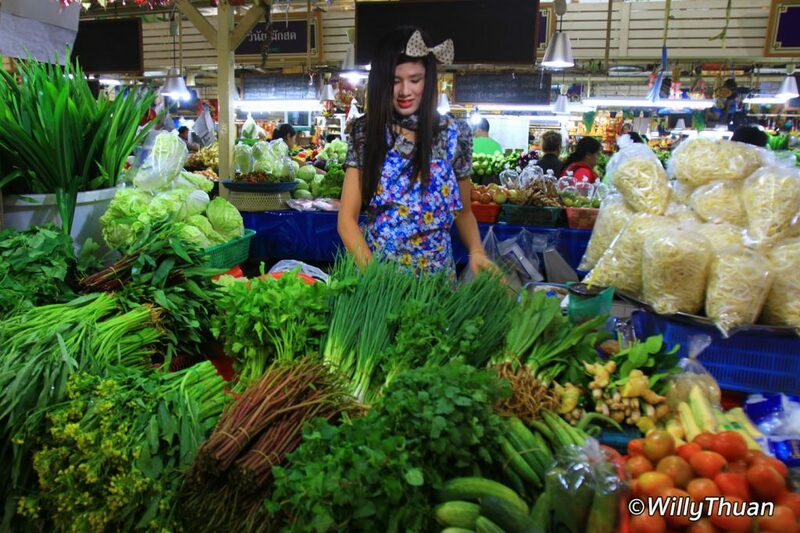 Get your first glimpse of fun looking Thai fruits, amazing fishes, strange veggies and colorful sweets! 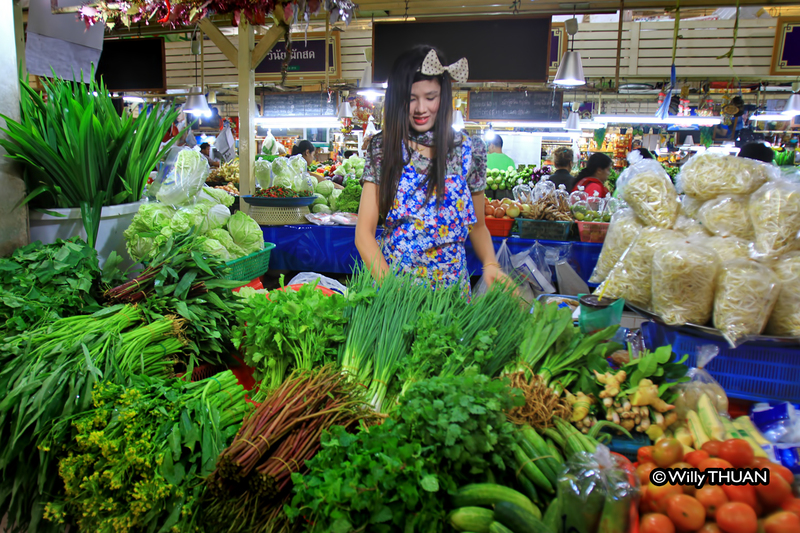 Banzaan Fresh Market (‘Banzaan’ means ‘fresh market’ in Hokkien) is very clean and bright, it might lack a bit of the local feel you get in other fresh markets on the island, but food on display is of very good quality and offers a wider variety as well. 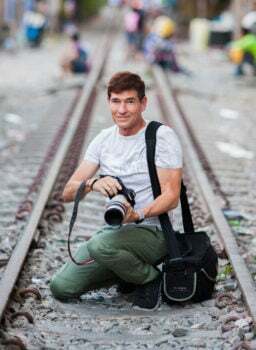 With such a convenient location, Banzaan is a good way to discover real Thailand the first days (You can always explore more local markets later). Banzaan Market is open all day but it’s a lot nicer to come in the morning, even at 10 or 11 am shelves are still well supplied. 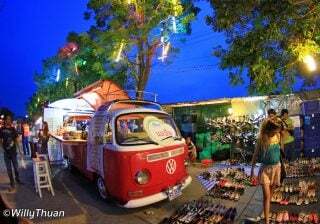 Later at night all the area around the market transforms into an immense street food. The ground floor is where all the fresh food is. 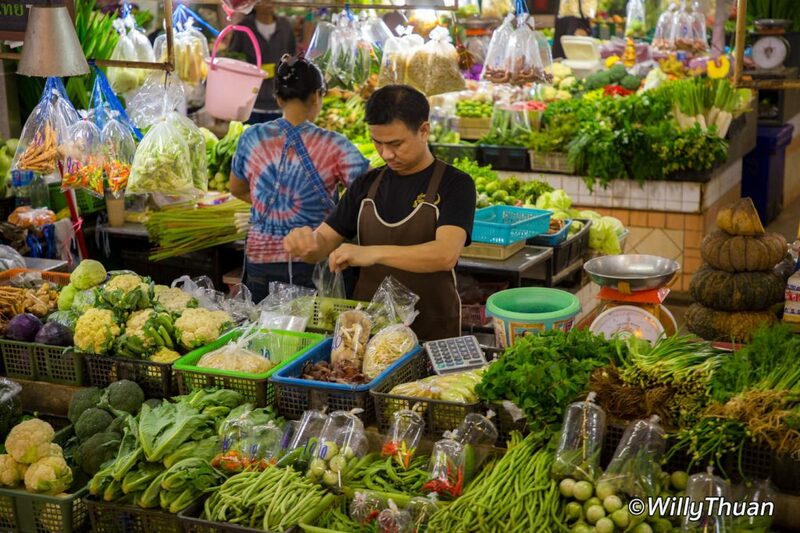 As most markets, the place is divided in zones: fruits, veggies, meat, fish and all the cooking ingredients. 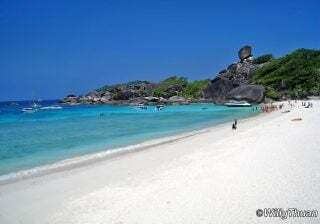 People are friendly and often speak a bit of English. 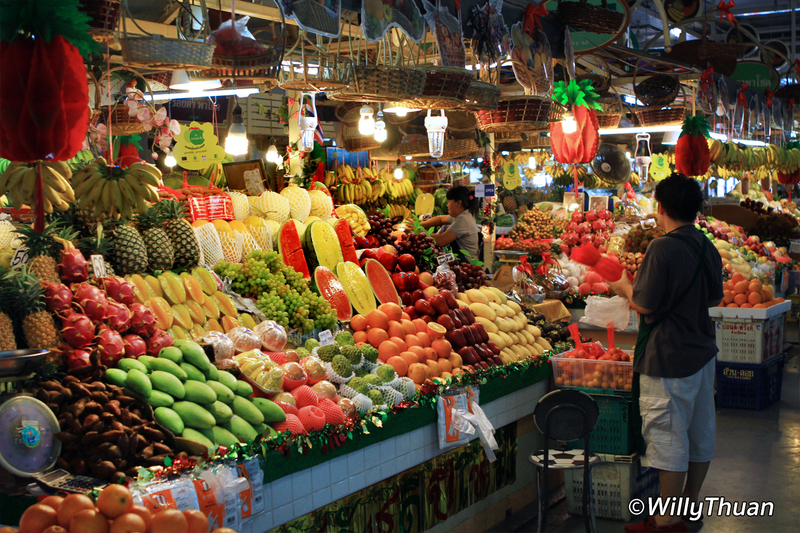 This will be your chance to see a lot of unusual Thai fruits, so don’t hesitate to buy some funny looking ones and try them. Except the Jack Fruit and the well known Durian, all other fruits, even scary or weird looking one like the Dragon fruit, the Salai or the Custard Apple are sweet and don’t taste strong. Veggies corner is always fascinating with so many unknown species of plants that often resemble more like weed. 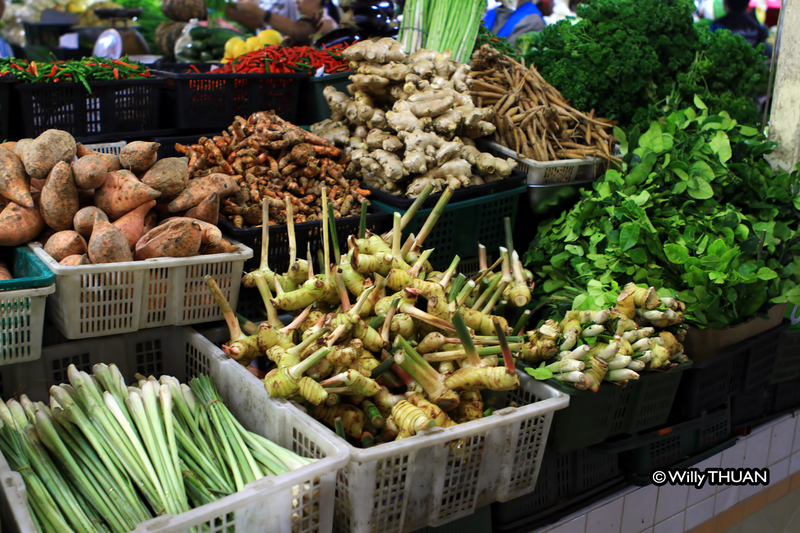 You might recognize the several ingredients used in the popular Tom Yam or Tom Ka: Lemongrass, Galangal and Kafir lime. Meat corner is probably not as popular as the fish area, but looks a lot more hygienic than in Phuket town market or local village markets. Despite their ‘raw’ display, meat sold in markets is often fresher than the one found in ‘better presented’ supermarkets. The fish corner is very interesting with a large variety of very fresh fish and seafood, but what catches the eye most are the live hanging crabs endlessly swimming in the air suspended by a string. Eels and catfish are still frantically swimming in their buckets and the cockle shells might spit at you is you stare at them too long. 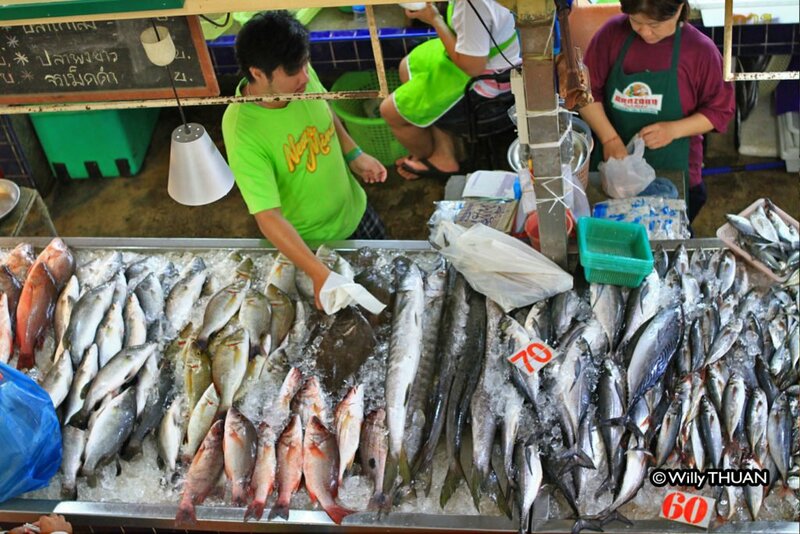 Once you are a little familiar with Thailand, you can buy your super fresh fish here and carry it to the food court upstairs to have it cooked for a small fee. Fun and apparently cheaper than ordering in a seafood restaurant. 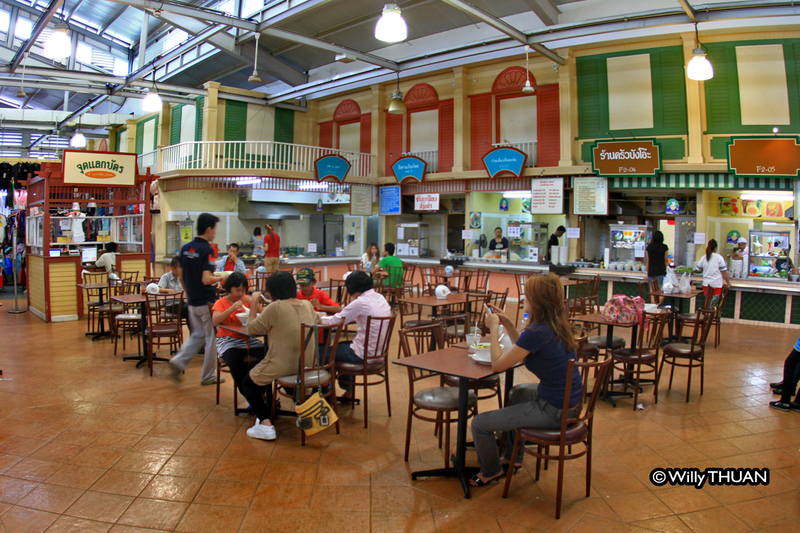 A set of escalators takes you upstairs where you will find a bit of clothing but mostly a large food court. As mentioned earlier you can buy your seafood downstairs and carry it to the one of the restaurants who will cook it for you. We haven’t tried it personally but seems to be a popular and fun way to have a seafood lunch. The Hemingway restaurant downstairs seems to be a lot more successful. One corner of the second floor sells unbranded cloths and jeans. 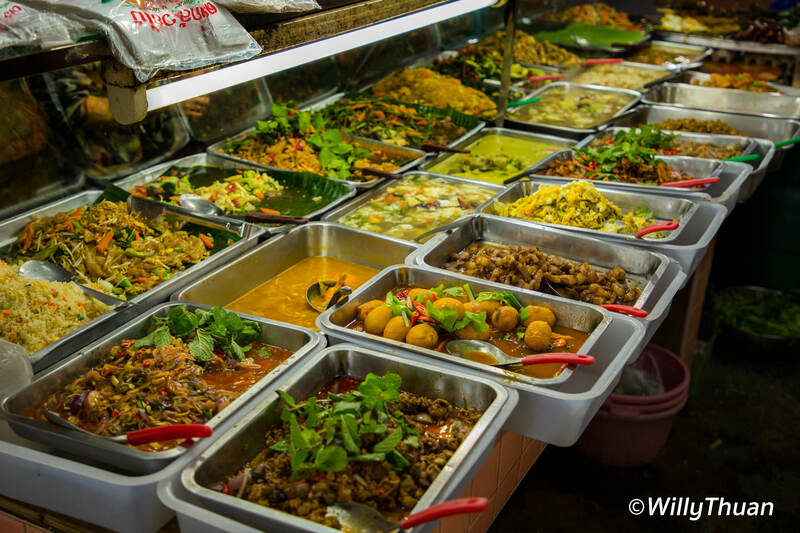 The Banzaan Night market mostly consists of food….a lot of food! 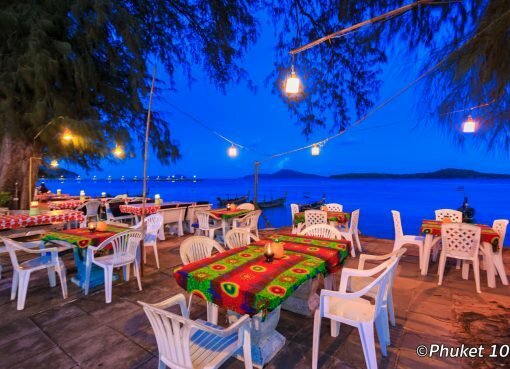 Walk around and admire a superb choice of seafood with huge prawns and the famous Phuket lobsters. 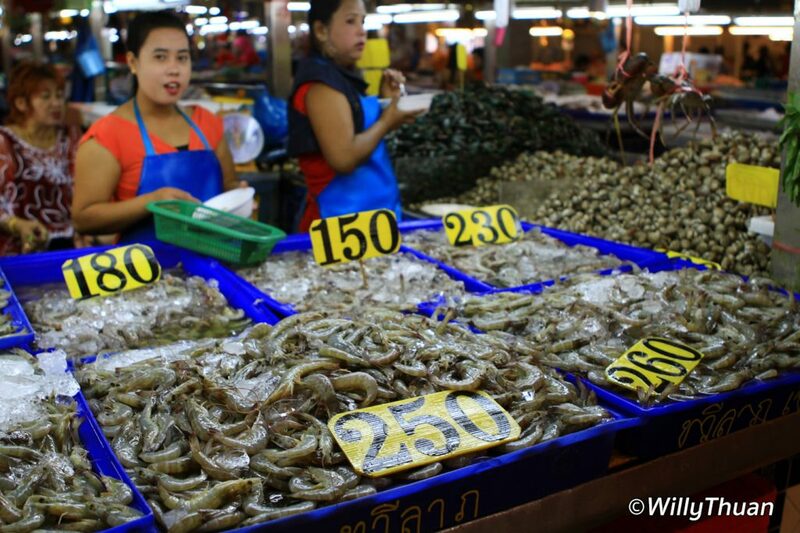 Pick your seafood, weight it and pay it…. someone will grill right in front of you. 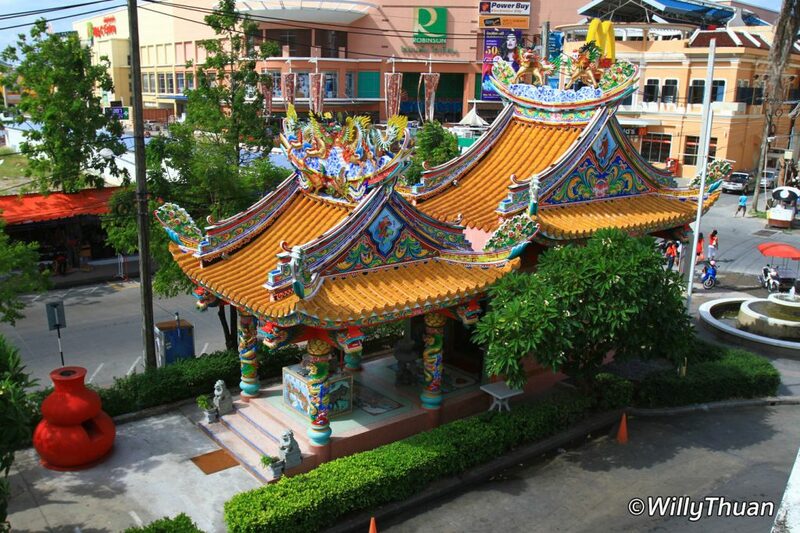 On your way in or out, have a look at the colourful little Chinese shrine, people often miss it, but it’s kind of cute. 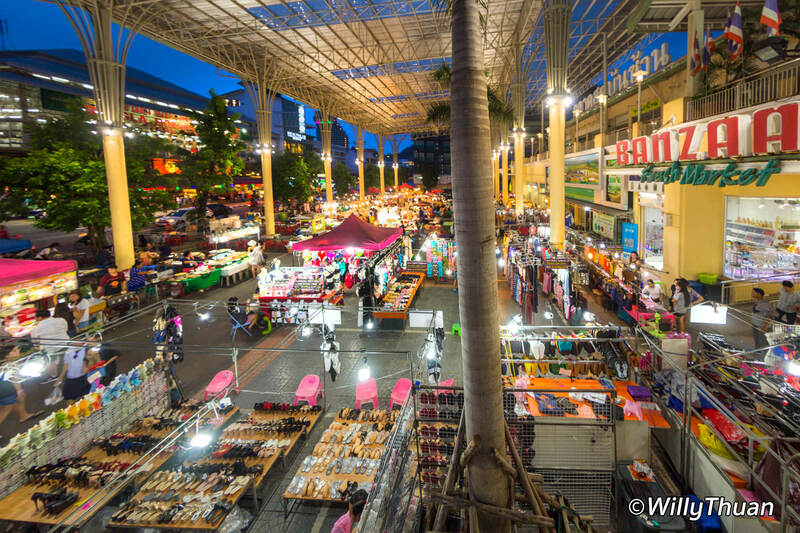 At night the street surrounding the Banzaan Fresh Market becomes a huge night market where you can buy food, sweets or drink from dozens of food carts.